Why Did I Finally Give in to a Generator? One of the first articles I ever posted on here was entitled “Why I Don’t Have a Generator”. When it comes to enduring a serious life scenario in which food, money, and human decency may be scarce, the typical generator is not a friend. It makes too much noise, thus attracting unnecessary attention, most of them require fuel which is very difficult to store and use safely; they only run for a short period of time, they can easily be destroyed with a strong solar flare or an EMP, they are bulky, cumbersome, and require lots of room for storage, they are wicked expensive for what you get, and even the solar generator versions use a lead-based battery which is simply not suitable to endure a year of full charges and full power exhaustion everyday--plus they have that pesky problem of bulging or having a "memory problem" in which if you use it a little and charge it a little then it gradually loses its capacity to be fully charged and fully drained. Sounds like an awful lot of expense for so much hassle. Why is a generator the last thing I want in my preparedness pantry? My personal position on having a generator was that it would be the last thing I would purchase--if at all; though I realize even before my changes that there certainly are some instance in which a generator (preferably a solar generator) would be medically necessary. So, perhaps you've guessed it by now. I have come to change my opinion on this matter for two reasons 1) as a result of my focus on the Principles of Preparedness (specifically Mental, Physical, Medical, and Fuel) and 2) Because I’ve found better technology which addresses the majority of my objections of regular generators (including solar generators). There’s a lot more detail available than I can write on this application, though I probably should take such measures in the future, but for today I’m just going to give a brief synopsis of why I finally broke down and got a solar generator. First of all, let me just say that the solar generator that finally got the attention of my pocketbook was a Humless. Yes, I looked, read, researched, Googled, and YouTubed every single option out there--including those only available for military uses--and when all was said and done, the two Humless choices were the only ones which met all of my criteria. They are quiet--duh, cause they are solar generators. They do not require fuel, and thus they don’t require me to store diesel; and it also means that they don’t give off any nasty fumes or other emissions. But being the gidget and gadget junkie that I am, I'm particularly fond of the fact that I can simply push a button on the Humless models and see exactly how much of a charge I have left (yes, I prefer such “idiot-proof” options). Also, I can fully charge the unit and have it sit there for an entire year without using it and still know that it will be reliable should i need it in a jiffy. 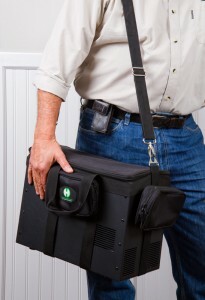 They are completely portable, and come in their own heavy duty carrying case with plenty of common sense pockets, handles, and a rugged shoulder strap. Their smaller version, the Roadrunner, is only 11 pounds and the larger one, the Sentinel, weighs in at less than 40 pounds so even I can grab those on the run and go. The smaller Roadrunner version can be charged with solar, hand cranking, A/C and D/C outlet plug-ins--even the car accessory plug in—all in a matter of a few hours. (O.K. maybe I fell in love with it because it was cute. *grin*) The Sentinel version can be charged with solar panels (a kit that I got to go with it or your own), hand cranking (not preferred if you’re conserving physical energy, but it’s good to have that option), windmill, and A/C or 12 VDC outlet plug in in a matter of hours as well. The various ways of charging it were really, really important to me. I've been trying to use my solar oven more these last few weeks and I don't always have sunshine. So I like to know that I have plenty of other options to charge it AND that when I do get a sunny day, I can capture the energy and store it until I need it. I also like both units have multiple ways that I can use them without any adapters, additional inverters, etc. (The Roadrunner has 110VAC outlet, 12VDC outlet and 2 USB outlets built-in to the unit and the Sentinel has two 110VAC outlets, two 12VDC outlet and four USB outlets). Considering that I literally fried all of my bangs off in one fail swoop using an "adapter" for a curling iron in the Philippines, this built-in functionality and ease of use was a big deal to me. (Some things one never fully recovers from. *grin*) I love that they use a custom-made inverter on their units too! I have to admit, though, that I did have a bit of a giggle when I saw the attachment that allows me to just screw in a light bulb using my Humless as an oversized lamp base. Bottom line, it’s easy and what I call "idiot proof". But here’s an aspect of the Humless that I never would have appreciated if I hadn’t done my research. The other similar systems out there store their energy in a lead-based battery, whereas the Humless uses a lithium based battery storage. (In fairness there's a similar type of unit that uses a lithium based battery storage but it's much smaller, with only a 5th of the AMPs and is missing a lot of the bells and whistles. 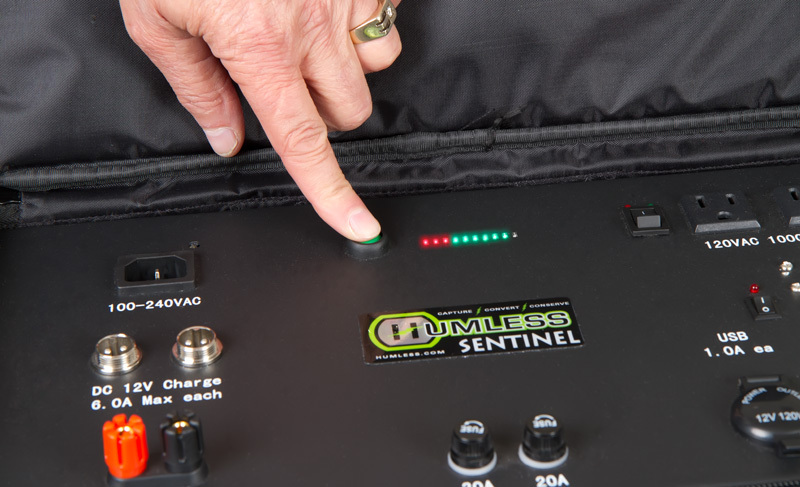 Humless actually has their own patented lithium battery system. It’s actually BECAUSE of this that the Humless can handle over 2,000 full charges and full drains, one right after another or over 10 years. The lead based batteries cannot handle more than 400 full charges/drains. This means that I can’t rely on a lead-based system to give me much more than a conservative year of service and even that’s debatable. And unfortunately gel systems are also unreliable for the time frame I would want. I look at all of my prep measures from the viewpoint of a minimum one year criteria. So from that standpoint, I had to go with the Humless technology. Here’s what I was most pleased with though. 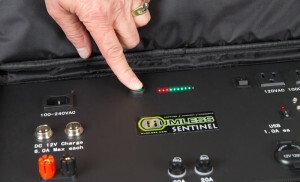 When I compare the Humless system to other systems out there that would consider themselves as competitive, I find that the Humless is providing me with more conveniences and options and over 5 times more charges for LESS than the lead-based and other systems. I was also impressed that the Humless works on anything from a 100 volt to a 250 volt need. Most units stop at a 200 volt. (It’s a 600 watt load because you can only store so much juice.) Plus, it won’t "blow a fuse." If you try to run something on it that’s more than 1,000 watts for example, the inverter simply won’t turn on, thus preserving the functionality of your unit. So I can’t use it for my larger capacity microwave when I need a heated rice bag in a hurry for an injury, but I could still use it on an 800 or 600 watt microwave. Obviously I just had to go with the Humless. But wait...I surprised myself by deciding that there was merit in having both the Roadrunner and the Sentinel solar generators. My reason for doing so is multi-fold. Remember, enduring a crisis which suddenly requires you to do more physical work, walking, and straining just to eat three meals a day, plus have suitable amounts of drinking water, environmental controls, lighting, and sanitation will wear on even the most fit body. So, if you can cut a corner on exerting physical energy unnecessarily, I would go for it. I don’t subscribe to having a generator in a long-term power outage just so that I can charge my cell phone, watch the local news on TV, use the internet, etc. Hello! In a serious power outage we won’t even have those options. (More unpractical is to think that you would want to power up an entire home--hello--just paint a target on your back in a crisis scenario why dontcha?) 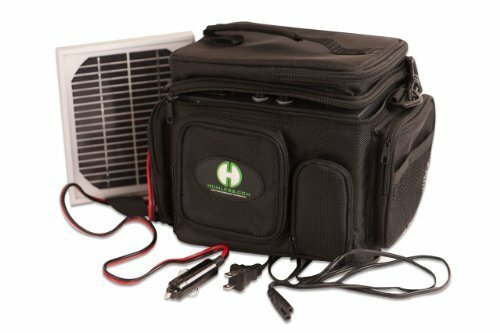 But, if I can use Humless' solar generator to power items to make cooking, sanitation, and administering first aid easier, then I’m going to go for it. 2) We can never underestimate the need for mental and emotional health in the midst of a crisis scenario. We simply can’t afford to underestimate the mental/emotional strain that a drastic change to our lives will put on us. And believe it or not, as little as a couple of hours without the conveniences we’re accustomed to can add emotional and mental strain. Heck, I get needlessly stressed when I can’t sit in my preferred seating at church or the movie theater sometimes, for crying out loud (Yeah, I’m a total basket-case at times. *grin*). But seriously, having to, all of the sudden, rely on your own capabilities to provide meals, water, clean clothes, and do more than push a button or flick a switch for heat and light will pose an emotional or physical strain even on the most hardened survivalists in the beginning, let alone those of us who make up the primary mindset. (you may breathe now after enduring that long, run on sentence) So, if cutting some corners safely and without compromising the health and well-being of my family is available, I can certainly see wisdom in taking advantage of that. 3) I have drastically underestimated the mental and emotional value of respite. I grew up playing board games on Sundays with my family; I think more families should find themselves enjoying this type of activity. And I’m convinced that I was one of the final holdouts before succumbing to purchasing a computer or a DVD player. In other words, I'm not much of a techno geek. The only video games I played as a kid was what was at the arcade and that little black and white tennis game that mildly resembled tennis. But even with that type of a background, I can see mental and emotional value in providing some semblance of “normalcy” under foreign and perhaps fearful circumstances. Thus technology does have it's place in a society full of adults and children who consider that "normal." I remember an instance in the Philippines where I lived for nearly a year and a half. Even though I was actively engaged in my responsibilities of helping others with medical, sanitation and other like needs-- and I wouldn’t trade that experience for anything-- I'll be honest, it was the hardest thing I've every done in my life! It was camping, but in a skirt! (remember, my idea of camping is when room service is late.) I still fondly recall one of my favorite times there, though. It was when a kind, elderly couple invited us over to their home "in the city." They made what I called a “real” meal" for us (something other than fish and rice), in an air-conditioned environment, and we were able to sit down on real furniture, and enjoy watching the video of “A Man From Snowy River.” Seriously, after living over a year in an environment in which I never felt quite clean enough (cold showers everyday), cool enough, completely filled up after a meal, and was just plain physically uncomfortable most of the time, this night with this couple really meant a lot to me. After recently going through the feedback meeting that our neighborhood had here after voluntarily try out a mere 24 hour period without electricity, and hearing about how much resistance many of the families got from their kids who complained of being bored or scared, I find some value in having access to providing an occasional moment of familiar respite. Personally, I’m a huge fan of music—good music that moves and inspires me. I also love snuggling by the fire with my husband and watch a action-filled good guys vs. bad guys movie. It’s brain candy for me. And you know what, I feel like I’ve underestimated everybody else’s capacity and my own to immediately adapt to a life void of these types of things. If I can provide a little bit of respite in order to get someone calmed down, more comfortable, or get their mind off of the stress of moment, I find value in that. For the past 10 years I’ve been trying to learn how to do more and more from scratch in my kitchen and cleaning efforts. When my husband married me I was a city girl who never even wanted to touch dirt or smell manure or have to swat at a fly. I still hate camping and I’m not sure I’ll ever get over that, however, today I’m actually wanting to move to a wide open space where I can grow my own garden, raise cattle and other farm animals, make my own butter and cheese with my own milk, and live more independently. That kind of mindset represents a long journey of being taught here and there, but even with all of the knowledge I’ve gained about how to do "this and that" without power, there are still some things that I would be more efficient doing with an electric power source. Instead of having to chop, chop, chop something or puree it for a great meal, I can plug in my food processor for a whomping 3 minutes and get it all over with. Instead of spending 10 minutes hand cranking a flour mill for just one cup of flour, I can plug in my Nutrimill and have 10 cups in less than 15 minutes, etc. Sure I can eventually learn how to live like I’m in the early 1800’s, but I’m all for conserving some physical energy when possible and gradually learning those skills that were pertinent in the 1800's rather than putting myself in a position of “MUST have these skills to survive in all areas.” That's just begging for more stress in my opinion. Being smart is getting prepared, period. But being wise is getting prepared not only for your own family’s needs, but also for the anticipated needs of others. I don’t want to have to worry about "so and so" who needs enough electricity to run her home medical devices. And if I can do something now to help prevent that fear-filled, vulnerable state, I’m going to do it. Sure it’s not cheap to prepare to help others, and we’re bound to miss our goals in our efforts in doing so, but I’m positive that if I do all I can with that mindset being a part of my preparedness efforts, then the Lord will use what little I have to give to make good things happen. To be forthright, in spite of all of these justifications for finally jumping on this particular bandwagon, my decision ultimately came down to a gut feeling. I don’t know all of the reasons why I might be able to use this valuable tool, but I do know that if I didn’t listen to what I felt was a little nudge to consider this option, I might as well stop prepping all together. But then again, that’s what most of my activities come down to—feeling led or taught to do things a certain way even though I may not fully appreciate why I’m doing it at the time. I hope that you, too, find yourself making key decisions of self-reliance in this manner. I guarantee you that it’s a much more accurate method of prepping that the Mayan calendar. On a personal note, since I bugged the Humless gang with so many questions repeatedly as a result of my research, I have discovered that not only do they produce an amazing product, but they are GREAT people too. I love how they think, problem solve, push, and professionally perform. Heck, I could even see myself having them over for dinner (Whenever you’re ready St. John, Glenn, and Adam). They’re just plain “Good People.” So, that seals the deal for me. Note: If you’d like to consider a Humless, let me share a little bit of an inside scoop with you. The Sentinel is going up in price. The information has changed a bit on this topic over the last couple of months but the up-to-the-moment scoop I have is that the price will increase by $255 as of January 1st, 2012—the Sentinel only. A few weeks ago the folks at Humless told me that the price increase was $200 on the Sentinel by December 1st, however, they just finished an overseas trip checking on supplies, quality, etc. and wanted to just do one price increase that they could stick with for a long time instead of inching it up gradually. Good thing I checked in with them just before posting this article. So if you want to save that chunk of change, and you think this may be an option for you, I'd purchase it soon. I've confirmed that Five Star Preparedness has a guarantee that they will beat any advertised price by $150 on either the Roadrunner model or the Sentinel. (I hate having to price shop on the internet). So they may be a good option for you. Plus, Scott, the owner, actually speaks techno-speak, so he may be much more helpful than I in answering capacity and use questions for you. Calling the Humless a "generator" is very misleading. You need to completely describe what Humless you have and how it provides power for you. The solar panels are the real generator. The "Humless" is merely an expensive battery and inverter. The Humless can be charged from solar or from your grid power system. The humless system bears no resemblence to what an ordinary person would consider a generator to be. 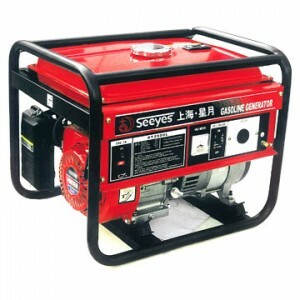 A decent generator, with fuel, will supply all the power you need to power a house for many days. The humless system, without being recharged by either solar panels or your grid system, will supply only a few items for a very short time. I'm not saying Humless does not have some place in a preparedness program, I'm just saying I would rather spend my $2000 some other place that gives me more than a few hours back-up power for a very few appliances. Actually, nothing could be further from the truth. The Humless IS a generator to the same extent that a gas, propane, diesel, etc generator is. In your comparison, you have taken away the "fuel" source of the Humless, yet you have conveniently left the "fuel" source intact with your side of the equation. Let's take away the solar "fuel" of the Humless and the gas, propane, diesel, etc, "fuel" of your generator and compare. The Humless will provide electricity for a while, depending upon what is used with it, while your generator will not even start up and thus will provide nothing. No one has claimed that the Humless is meant to power heavy duty electricity-hogs. It is meant for smaller appliances that would be used in an emergency event for two principles of preparedness - Physical (using it on small jobs where it will help to conserve physical energy, such as kneading dough, grinding grains with a smaller grinder, etc) and Medical (keeping medications refrigerated in a smaller refrigerator, etc) - though it can be used for lighting and a host of other uses. I see no problem in comparing it to other generators, or in calling it one to begin with, so long as you make apples to apples comparisons, which you have not. No one should be looking to completely replace their power requirements that they have today, unless they have completely prepared in other areas. This is a very generalized statement, of course, so don't take it out of context, but hopefully you'll get the idea. It is why we didn't sign on to the idea of having a generator at all until this particular model came along, which took out so many of the negatives (fuel supply, noise, etc) that so many of the other generators have. We simply are not looking to use as much power in an emergency situation as we would in everyday life today. Oh yes, and solar panels are not generators. They are "fuel" collectors. The generation comes from the inverter converting the stored electricity into useable forms. "...Medical (keeping medications refrigerated in a smaller refrigerator, etc)..."
For how long would the Sentinel run a mini (dorm room size) refrigerator? I need something like this to last for a 2-3 day power outage. Thanks. Well considering it ran the large freezer for 24 hours (with stops and starts--you don't need to run it consistently to keep it cool) then I'm certain that it would do the same for your mini-fridge, you would have to take advantage of the off time though to recharge. That's what I thought might be the case, the need to recharge. Think I need a small off-grid complete solar system then. Thanks. One of your previous concerns was the EMP scenario. The Humless appears to have some serious electronics built into it. How EMP proof is it? Am i going to need to build a Faraday cage to keep it in? Yes, the Humless, like any other generator that converts from DC to AC (and most others as well), does have a lot of electronics inside it and would need to be protected in a Faraday Cage in order to survive an EMP. Anything with a diode or transistor in it that is not sufficiently shielded (no civilian generator fits this bill) is subject to an EMP. Thanks for the great write up on Humless. I just recently discovered them too and was wondering how long my research would take. Now you've done it for me! I have asked Five Star for a shipping estimate. $200.00 is a nice discount. My 2000 watt, 50 lb, 58 decible Yamaha "generator", with 10 gal of rotated gasoline, which I keep stocked anyway to put into my car if emergency requires, will run more appliances with less hassle for a much longer time at 1/2 the cost of a Humless. Again....not saying Humless has no place in preparedness, just that as a cost effective replacement for a "traditional" generator I believe there are much better choices that cover a much broader range of uses than does the Humless. Calling a battery a generator is still a pretty loose interpretation of the term as far as I am concerned, and gives someone who isn't 100% knowledgeble a false sense of what he is getting. In a car, for example, the battery is in no way considered a generator. It stores power. The alternator is what "generates" the power. All I want is for potential purchasers to know exactly what they are buying. Yes, that is a nice generator, until you run out of gas, either by putting it into your car or into your generator. And, when you have no more gas, you have no more use for your generator, other than as a large paper-weight, while the Humless can be recharged by solar panel and continue being used and useful. The point being that you are not comparing apples to apples but are making generic statements that have no basis. I agree that a larger generator will power more appliances. I agree that a battery is not a generator (no one said it was, only said that the inverter generates electricity off of energy stored in the battery). I agree that people need to do their homework to decide which solution is best for them and their particular needs. That said, the Humless is a great solution for a great many people for their particular needs. The Humless is a generator, pure and simple. It generates AC from DC, and still allows the DC to be used as-is. The fact that it needs an energy source to continue being useful should surprise no one, except those that believe you can get free energy from nothing. However, unlike your generator, which I assume does not have the attachment for turning garbage into useable fuel, the Humless generator, with a simple attachment, can continue to be useful when the power is out by simply hooking up an attachment that turns solar energy into stored energy, which the Humless can then use. That to me seems to be a significant advantage over any gas-type powered generator for the longer term under circumstances where you can no longer get gas out of the underground tanks because there is no electricity to run the pumps to do so. I think you've made the point of the article stand out even better in that regard. Thanks. Scott....you may be an elecrical engineer, I am not....however to say that solar panels are only fuel collectors is nonsense, unless you wish to expand your argument to say that electricity is fuel. I run a solar powered submersible well pump straight from my solar panels with no intervening batteries, etc. They obviously supply electricity. They obviously do that by converting sunlight to electricity, thus "generating electricity". By simple logic then your battery/inverter (Humless) is not a generator and has no way of generating electricity itself. It serves a storage capacity only. To call the inverter a generator is likewise illogical. It changes existing power, the electricity stored in the battery, from one form to another, 12 VDC to 120 VAC. Without daily recharges, under use, your Humless becomes a discharged battery which can generate nothing. It only stores what is generated elsewhere by some other means. Not trying to denigrate you or the Humless. I just like precision in the language of adverising. Yes, you have stumbled across my slightly facetious part of the comment. Yes, solar panels convert solar energy into electricity, which can be used at that time or simply stored in batteries for later use. Yes, an inverter generates AC from DC stored power, which resides in a battery, or could be used straight from the solar panel, which would mean only using it when the sun is out (if no battery is present). The problem is that you are focusing on minutia, rather than seeing that your previous argument was based on a faulty foundation. If you will compare apples to apples in the land of generators, you will find that the Humless is infact a generator, in much the same way as other generators are, and that is has a place in the preparations of many people, regardless of the fact that it will not power a TIG or MIG welder or a lathe or any other large appliance (that is not its intention). A generator is not something that converts energy out of nothing, but rather something that converts energy from one type to another, whether that be from gas to electricity, as in the case of your generator, or from battery stored DC to useable AC, as in the case of the Humless. No, batteries do not need daily recharging to continue being useful and charged, though they should have a maintenance charge every so often. Bill, I've conversed with you for a long time now and I have a great deal of respect for you. Which is why I'm very surprised at your comment. Seriously? You don't see this as an exercise in brain gymnastics or perhaps just semantics? If I were to follow your line of logic then the only thing I could consider a generator of power is a dam, wind mill, the sun, and a nuclear reactor. Your solar panels are simply a converter of power and that power has to be banked somewhere. A gas fueled "generator" isn't a generator at all by your definition as it's simply a converter of fuel what's put partially into a bank and then used. I specifically stated the multiple ways that the Humless uses to store the fuel in it's unit. Hand cranking, good ole fashioned plugging it into a wall, wind mill, or solar. How is that any different, though on a significantly smaller scale than your set up or even the much larger set up we enjoy with large solar panels? Solar panels do not supply electricity. The sun does. The panels simply harness it. incompetent at expressing them in techno speak. :-) This is no different than when I have a dreary, sunless day followed by a sunny day with my solar panels. I'm still able to use the panels and bank the energy for use at a later time. So can we all stop being so silly and nit picky and focus instead on how we're going to help other people embrace a more self-reliant life style...Please?? Thanks for publishing my replys.....The world revolves and evolves on minutia. As long as everyone really understands the terms, I am happy. Think OPSEC (operational security). The Humless is totally silent so your neighbors and the bad guys won't know you have power. Hunkering down silently when the SHTF just might keep you alive. I have a 7K watt gas generator and 100 gallons of stabilized gas but I won't use it, even in my garage, unless I think it's safe to make all that noise. Well done debate on all sides. I likewise have stored gasoline, but the thought of how quickly it would be depleted by a generator made that option less appealing. If you already own one, by all means, keep it, it's an asset to be used and shared. I appreciate the alternative of a limited source that's available for a longer period of time. Some questions re the solar panel; what are its dimensions, and does anyone know the EMP survivability of PV cells? The solar panels are about four feet tall and about 2 feet wide. PV cells won't have any problem with an EMP. But keep in mind that it's the DIODES, folks, that EMPs ruin. Thanks for the prompt reply. We purchased our set this morning, and I'm glad we won't need a huge faraday cage for the panel. Thank you for your insight on many confusing facets of the world today. Yeah, for that kind of scenario you'd want major solar panels in my opinion. However, for a truly long term scenario when everyone around you is struggling to survive, there's no way that I'd want to attract the attention that a full solar panel system would do. Kellene, does the Humless come with the solar panels or do you need to buy them separately? We have our own to attach to it, but yes, you'd need to purchase the solar kit separately if you want to charge it that way. I do not know how much that costs, though, Sorry. Interesting. After 40 years of working on small, medium and large generators (the last being diesel locomotives) I must say that everyone here is right to an extent. All the generators, inverters, energy collection/dispersion devices discussed here are tools. A hammer can be used to drive nails but in a pinch can open a can of beans. The same as each power source discussed here has a primary function. There are areas that overlap and that seems to drive the controversy. Let me first state that I have no dog in this contest, rather I own and on occasion operate all of the these systems. For camping in my trailer I have (2) Honda eu2000i generators which are very quiet and provide excellent service at the task for which they were designed. On home backup I have an 8K diesel generator with automatic start and transfer. In my radio room I employ several industrial sized batteries which can be charged either by conventional power of 50 watt solar panels on my roof. For portable operation in closed areas or quiet zones I have built my own high current Lithium battery pack with inverter if 120VAC is needed. Like the Humless it to can be charged with a built in charger or through a regulator off a portable 50 watt solar panel I bought at Costco. While all of these power sources can be, to a certain extent, interchanged, I choose to use them for the for the task they were best designed. As for fuel storage, if there were to be an event that was so devastating that it closed roads in and out of the area, there would be no shortage of fuel. Sound weird? I might have thought so but being a first responder after Katrina, setting up radio communications, I found hundreds of cars with plenty of gas with no where to go. Even here in Happy Valley everyone has extra cars, trucks, snowblowers, etc. that would be left behind if they choose to evacuate. A second backup would be my neighbors. I plan to go into the whole wheat bread making business. With tons of wheat and the good stuff to make it into bread, I could make bread in my 25 Dutch ovens and 2 solar ovens enough to feed the neighbors for quite a while. Want bread? Bring some fuel to run my generator. While this post is longer than I intended, I just want to say "Stay flexible" and be willing to learn from one another. Just received my sentinel a few weeks ago and haven't tried it out yet. We didn't receive a handbook or how-to book so I guess we'll wing it. I too have a fuel gen erator but really liked the idea of the quietness and flexibility of the Humless. 1) 80/40 meter dipole antenna. MFJ, Alpha Delta, Etc. That will set you up. The 718 I use at the church EOC and it's a simple nice rig. The auto tuner is made to plug right into the ICOM and will match anything you throw at it. If you want a used HF radio, you can find them cheap. Watch local on line ads. Here in Utah it's KSL.COM. Not sure where you are but we have a local dealer here in Salt Lake that carries all this and more. I appreciate the discussion here. 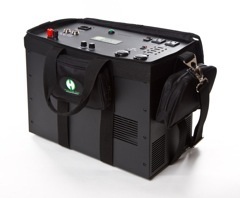 I just received my Humless generator, NOT the nice Sentinal model, but one that Jim Bakker offeres, has less plug in`s and storeage pockets...but I also just received my solar Panel, the folding one. Problem is I am not savvy with how some of it is to be connected, and would love to have more instruction details for people like me! I am wondering if I have to have the fuel less generator plugged into the wall, in order for the solar panel to be able to work properly...sounds dumb I know, but the small red/green light next to the Anderson type [?] plug in for the solar panel is not working. I have yet to receive the 'bongle cord' so I can hopefully use the 20 ft. extension made for the solar panel . For now, the only cord I have is the very short one connceted to the twin solar panels. there is no connector that allows me to add the extension cord. The fuel less gen. is fully charged now, but shouldn`t the solar panel still collect the sun`s energy and store it in the panel? I had the panel plugged into the red and black plug in, but the red/green light did not come on...I did have the red key turned on. I tried both with the fuel less gen. plugged into the wall, and w/o it being plugged into the wall. there is no fuse that I can see....There again, more detailed drawings or explanations of these details would certainly be appreciated. So I may call J.B. again and see if they can tell me when the rest of the shipment is going to be...this is January 2013...had an ice storm yesterday and now they say we may get super cold, wind, etc. tomorrow night and the next day. So would feel better if I had the generator/solar panel able to work, should we get some sun light, when the generator is about depleted and I have no house electricity. Sorry for the long explanation! thanks for any help/advice .. Sounds like you purchased the little Roadrunner. Humless won't be making the Roadrunner any longer. However, I do have a video on our YouTube channel of recharging the Roadrunner with the solar panel kit. So that should help. Just go to YouTube.com and put in Preparedness Pro and you'll see it there. Solar panels don't STORE energy. They simply conduct it. If your Roadrunner is fully charged, the solar panels aren't going to do anything for it. Sounds like you need to get some answers from the people you bought the products from. Actually, that's only part of the reason, Alan. There are better articles than this one that illustrate why I'm NOT in favor of a traditional generator, and the fuel source availability is only one of those reasons. You seem to not advise folks to look at Gas /Lp Generators stating when there is no more gas or propane left on earth, they are mere paperweights, You have obviously not seen on YOU TUBE the many LP & Gas powered generators utilizing wood chips units that can power a entire house with 13 hp mtr, and 7000 watts , As long as there are trees/pallets/ scrap lumber on our planet! Check out Gasification or Gasifiers on you tube , This are so very easy to build, utilizing chunk barrels and piping! I am seriously considering the Humless. In doing my due diligence research on a $$ item like this I have found that a smaller competitive lithium battery system has been discontinued by its manufacturer although its still being offered for sale by retailers. The reason was possibly because of reliability problems and too many warranty claims. As discussed elsewhere lithium batteries have advantages but need a well designed battery management system and cell design -- if not the system will be toast in shirt order. Witness the recent lithium battery problems Boeing had with its 787. Also exploding lithium batteries in laptop computers. Since this thread is a couple of years old do the folks who have had a Humless for a while have any comments on its reliability? Actually, that's not the reason at all. It's all about what the public was clamoring for and where the capital could be be utilized. However, there's something you should know about the Humless lithium battery--it's specialized and proprietary. There's NO other unit out there that has the same lithium battery technology. Where other units sternly advise you to never let your battery drain all the way, the Humless is perfectly fine with a full drain then a full charge. 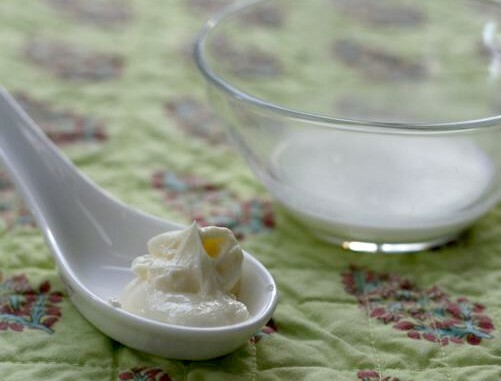 It's created for some REAL LIFE use, not pampering like a nanny. :-) There seems to have been a batch that came over that they had problems with and did a lot of exchanges or fixing, but that was quickly rectified and now it's A-OK. I didn't know this was out there. An interesting idea, I could've used it when the power went out a few years ago when a nasty snowstorm hit the northeast oct. 2011 and I was out of power for a week. I cannot find the Roadrunner generator anywhere.....do they still make it? Sorry, no, they do not. They are actually selling a larger unit. now that is an improvement on their Sentinel version.